The man who served as the no. 2 official in Saddam Hussein‘s air force says Iraq moved weapons of mass destruction into Syria before the war by loading the weapons into civilian aircraft in which the passenger seats were removed. The Iraqi general, Georges Sada, makes the charges in a new book, “Saddam’s Secrets,” released this week. He detailed the transfers in an interview yesterday with The New York Sun. The discovery of the weapons in Syria could alter the American political debate on the Iraq war. And even the accusations that they are there could step up international pressure on the government in Damascus. That government, led by Bashar Assad, is already facing a U.N. investigation over its alleged role in the assassination of a former prime minister of Lebanon. The Bush administration has criticized Syria for its support of terrorism and its failure to cooperate with the U.N. investigation. The State Department recently granted visas for self-proclaimed opponents of Mr. Assad to attend a “Syrian National Council” meeting in Washington scheduled for this weekend, even though the attendees include communists, Baathists, and members of the Islamist Muslim Brotherhood group to the exclusion of other, more mainstream groups. Mr. Sada, 65, told the Sun that the pilots of the two airliners that transported the weapons of mass destruction to Syria from Iraq approached him in the middle of 2004, after Saddam was captured by American troops. “I know them very well. They are very good friends of mine. We trust each other. We are friends as pilots,” Mr. Sada said of the two pilots. He declined to disclose their names, saying they are concerned for their safety. But he said they are now employed by other airlines outside Iraq. The pilots told Mr. Sada that two Iraqi Airways Boeings were converted to cargo planes by removing the seats, Mr. Sada said. Then Special Republican Guard brigades loaded materials onto the planes, he said, including “yellow barrels with skull and crossbones on each barrel.” The pilots said there was also a ground convoy of trucks. The flights – 56 in total, Mr. Sada said – attracted little notice because they were thought to be civilian flights providing relief from Iraq to Syria, which had suffered a flood after a dam collapse in June of 2002. Mr. Sada said that the Iraqi official responsible for transferring the weapons was a cousin of Saddam Hussein named Ali Hussein al-Majid, known as “Chemical Ali.” The Syrian official responsible for receiving them was a cousin of Bashar Assad who is known variously as General Abu Ali, Abu Himma, or Zulhimawe. Mr. Sada acknowledged that the disclosures about transfers of weapons of mass destruction are “a very delicate issue.” He said he was afraid for his family. “I am sure the terrorists will not like it. The Saddamists will not like it,” he said. He said he had not shared his story until now with any American officials. “I kept everything secret in my heart,” he said. But he is scheduled to meet next week in Washington with Senators Sessions and Inhofe, Republicans of, respectively, Alabama and Oklahoma. Both are members of the Senate Armed Services Committee. The book also says that on the eve of the first Gulf War, Saddam was planning to use his air force to launch a chemical weapons attack on Israel. When, during an interview with the Sun in April 2004, Vice President Cheney was asked whether he thought that Iraqi weapons of mass destruction had been moved to Syria, Mr. Cheney replied only that he had seen such reports. An article in the Fall 2005 Middle East Quarterly reports that in an appearance on Israel’s Channel 2 on December 23, 2002, Israel’s prime minister, Ariel Sharon, stated, “Chemical and biological weapons which Saddam is endeavoring to conceal have been moved from Iraq to Syria.” The allegation was denied by the Syrian government at the time as “completely untrue,” and it attracted scant American press attention, coming as it did on the eve of the Christmas holiday. The Syrian ruling party and Saddam Hussein had in common the ideology of Baathism, a mixture of Nazism and Marxism. 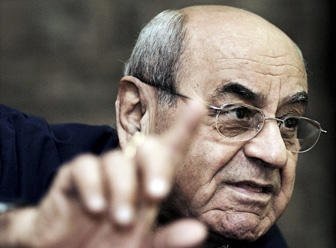 Mr. Sada is an unusual figure for an Iraqi general as he is a Christian and was not a member of the Baath Party. He now directs the Iraq operations of the Christian humanitarian organization, World Compassion. Note: This article was originally published in 2006. Want to know day of Jesus' return? AL QAEDA TARGETS LEADING ARAB EVANGELIST IN THE U.S.